Do you think your sleeping habits are weird? Well, you might think about that again when you learn about some of the strange and downright freaky sleeping habits of some of today and history’s most prominent figures. Sleep is a valuable commodity, but many of us don’t get enough of it. Everybody has their unique approach to sleeping and celebrities are no different. Examples of normal celebrity sleeping habits include former US President Barack Obama, Terminator and former California Governor Arnold Schwarzenegger who both sleep for 6 hours per night. Then, things get a little bit strange when you learn that Leonardo da Vinci viewed sleep as unnecessary and elected to take short power naps multiple times per day instead, and Mariah Carey who sleeps for 15 hours surrounded by dehumidifiers. Here are some more freaky celebrity sleeping habits. Wartime UK Prime Minister and statesman Winston Churchill was very passionate when it comes to naps, taking a two-hour nap every single day before 5pm. He did this because he felt more productive at night and would often be wide awake in the early hours, grinding out work. Writer Charles Dickens would sleep facing northwards (seriously, he kept a compass on him at all times) because he believed this improved his creativity. Yahoo! CEO Marissa Meyer works as much as 130 hours every single week, sacrificing sleep in the process. To catch up on sleep, she takes a week-long vacation every four months. Tom Cruise is a loud snorer and sleeps in a soundproof room so that he does not disturb other people with it. When the door is shut, no sound escapes the room! 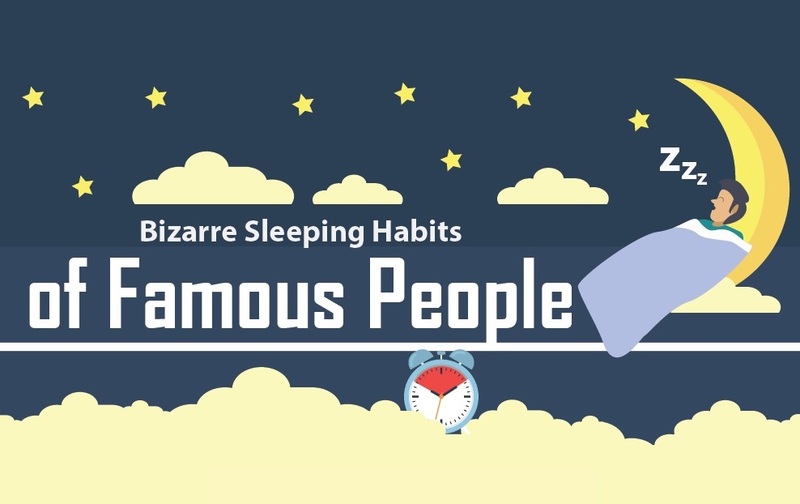 If you want to learn more about some of the freakiest sleeping habits of celebrities, check out our infographic below.